The court in Yangon is holding preliminary hearings to decide whether reporters Wa Lone, 31, and Kyaw Soe Oo, 28, will face charges. Yangon: Two Reuters reporters appeared in a Myanmar court for the 11th time on Wednesday, which marked 100 days since they were arrested in December and accused of possessing secret government papers. "We have spent 100 days in prison," Wa Lone told reporters during a break in proceedings. "Our journalism spirit was never down even after spending many days in there." Wa Lone's younger brother Thura Aung, 26, gave testimony on Wednesday, describing a police search of the family home on the evening of Dec. 13, the day after the journalists were arrested. His testimony contradicted Police Major Soe Aung, who told the court two weeks ago that police had presented a warrant to Wa Lone's family when they arrived. 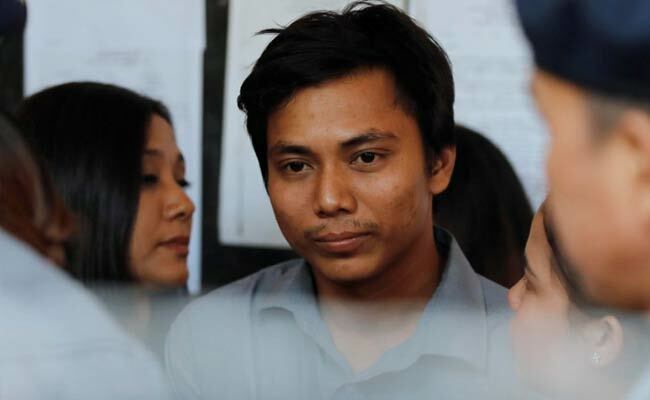 Defence lawyer Than Zaw Aung told reporters after the hearing that under Myanmar's Criminal Procedure Code police must identify themselves and explain the reasons for their search. "In the criminal procedure, the search officer must show the search warrant at the search place," he said. Wa Lone and Kyaw Soe Oo had been investigating the killing of 10 Rohingya Muslim men in a village in western Myanmar's Rakhine state during a military crackdown in August. "They have been detained in Myanmar since December 12 simply for doing their jobs as journalists," Reuters President and Editor-in-Chief Stephen J. Adler said in a statement. "Wa Lone and Kyaw Soe Oo are exemplary individuals and outstanding reporters who are dedicated to their families and their craft. They should be in the newsroom, not in prison." Myanmar's ambassador to the United Nations, Hau Do Suan, said last month that the journalists were not arrested for reporting a story, but were accused of "illegally possessing confidential government documents". The U.S. Embassy in Yangon tweeted: "Today is the 100th day in detention from reporters Wa Lone and Kyaw Soe Oo. Freedom of the press remains critical for Myanmar's democratic transition." Diplomats from countries including the United States, Canada, Sweden attended Wednesday's hearing. The Danish embassy, which has closely monitored the case, said the pair had spent "100 days behind bars for ensuring the public's right to information". A statement from Sweden's embassy said: "We believe they have done nothing wrong and that the charges against them should be dropped immediately." EU Ambassador to Myanmar Kristian Schmidt, asked about the journalists' reporting of the Rakhine crisis, said it was imperative to establish what had taken place there. "We all want to find out the truth of what happened," he said. "I fear for the moment we have not seen the full truth of what has happened."